Building an Effective, Robust, & Sustainable German Program – Margarete Lamb-Faffelberger, Ph.D.
During my twenty-five year career at Lafayette College, I have dedicated my energies and efforts to building a German program that attracts students from all disciplines who want to become strong communicators, perceptive critical thinkers, and successful problem solvers. Therefore, I strive to provide an educational environment for my students that will enable them to develop proficient lingual and cultural literacy in German. Language study and cultural inquiry go hand in hand on all levels in my German classes. Throughout the four-year curriculum, I expose my students to cultural inquiry so that they will become competent in knowing “how, when, and why to say what to whom.” In other words, students study the language, culture, and literature as an organic whole because the core learning objectives are aligned with the World Readiness Standards for Learning Languages as designed by the American Council on the Teaching of Foreign Languages (ACTFL) and AAC&U’s VALUE rubrics. Leading class (in 2007) as we converse simultaneously with students and scholars in Germany (U of Paderborn) and Austria (U of Vienna), and at Colgate and Vassar. My German classes (elementary through advanced levels) meet regularly in the Resource Center where I utilize everything from international television/media programs to the latest pedagogical software. I design specifically tailored activities and/or assign materials that complement our texts and workbooks. To augment listening comprehension, the study of authentic materials is essential. These materials provide an opportunity to hear different German accents, to listen to conversation in an authentic situational context, and to be confronted with still and moving images that enhance the spoken word. My students learn to make use of a variety of digital media for recording their speech and creating narratives with imagery such as Audacity, Comic Life, PulpFiction, Fotomagico (former iMovie), etc. I select the software option depending on the assignment. For instance, in a beginning German class they may use PulpFiction to create a menu for lunch and dinner items. They enjoy using Audacity and WireTap in combination with images from the computer’s camera to produce their portrait. They use Fotomagico to create a digital narrative, see “Fremdsein” from German 211. Also see two course and assignment descriptions and finished projects from German 311 and German 441. With funds from Lafayette College, I designed a computer-based enrichment program to improve listening comprehension, to assist in vocabulary building, to review grammar and spelling, and to refine writing skills (in accordance with ACTFL proficiency guidelines). The materials for this program were created from the online Deutsche Welle site. In addition, my students learn about diverse customs and traditions of the German-speaking world. In particular, the SmartBoard in our Resource Center has allowed me to reach my students in new and exciting ways. I was encouraged to read their comments on the course evaluations. For instance, one student stated that this was his first course at Lafayette “which has chosen to utilize the resource center and the technology that exists within it,” and went on to say that “insight into the true German media has been invaluable in allowing my speed of understanding to increase, as well as my vocabulary.” Another student stated that “the most valuable part of the course was listening to the news clips – it helped so much to hear German as it is spoken by the German public, and it helped me to understand better what it means to be fluent in the language.” With funds from the Andrew W. Mellon Foundation, I created a German Self-Paced multimedia program using hypercard templates (Herren-Templates). The five-semester language-and-culture-learning sequence was offered to select students who struggled to continue taking German due to scheduling conflicts. In 2004, I became a founding member of GLAC (German in Liberal Arts Collaborative). As a GLAC member, I designed and taught several upper level German seminars in collaboration with a number of US and overseas institutions that greatly enriched our study of literature with diverse cross-cultural and interdisciplinary perspectives. Below, I outline the concept that I developed for teaching across institutional and national boundaries with the use of a variety of technological tools. Why Organize and Teach an Inter-Institutional Course? Alysse Henkel (’08, B.A. Anthropology & Sociology and German) speaks with Valie Export. A student from Prof. Silke von der Emde’s class at Vassar College asks Nicolas Stemann. The final projects in my literature seminars are often digital narratives of self-reflection whereby students assess their growth and achievement and make a case for a grade using evidence from their course portfolio. I have continued to build on these concepts as I expanded my course offerings to make the expertise of our Max Kade writers-in-residence available to my students. For instance, in Spring 2013, Oliver Kluck, a rising star among the new generation of German playwrights, designed, rehearsed, and directed a play by my students featuring body language. In Spring 2014, the cultural critic Bernhard Doppler taught the course “Narrative of German Migration to America” that culminated in a German Festival during which students gave presentations of various kinds such as demonstrations of their Fotomagico projects, presentations on research findings, recitations of literary excerpts and songs from a 19th century German-American music book. In Spring 2016, the Bulgarian-Austrian author Dimitre Dinev taught creative writing to my students who learned to explore their own literary creativity and, in the end, produced remarkable pieces of literature. The two VIDEOS above are creative writing projects produced under the guidance of Dimitre Dinev, 2016 Max Kade writer-in-residence. The AUSTRIAN-AMERICAN PODIUM DIALOG (AAPD) is another project that I initiated after I was inducted into the Viennese writers association Podium in 2011. In November 2013 and 2015, I organized two symposia with four Austrian writers and four American scholars of Austrian literature (together with the Austrian writer Gabriele Petricek; sponsored by the Austrian Foreign Affairs ministry, the City of Vienna, the State of Lower Austria, the Austrian Cultural Forum New York, and the Max Kade Foundation). In order to involve my students in a meaningful way, I taught seminars during which we read, interpreted and analyzed those texts that the invited authors later read during the symposium. In order to hold fruitful interviews with these authors and scholars, my students had to prepare questions and practice their listening comprehension and free speech for which I designed meticulously scaffolded exercises. Furthermore, I took part in developing assessment practices using electronic badges (http://lafolio.lafayette.edu/assessment/) and co-authored the article “Electronic Portfolios: A Blueprint for Deep Language-Learning and Assessment” with Michelle Geoffrion-Vinci and Mary Toulouse IN: ADFL Bulletin, Vol. 42, No. 2, 2013: 36-60. Since the publication of this article, I have been invited to present lectures and workshops on the subject at US institutions and German universities (please see my CV). In 2009, my achievements in teaching the German language, culture and literature with the use of technology was recognized nationally when I received The ACTFL/Cengage Learning Faculty Development Programs Award for Excellence in Foreign Language Instruction Using Technology with IALLT. 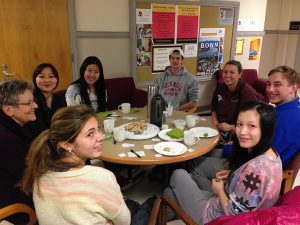 All German courses at Lafayette College are designed to foster the global literacies necessary to succeed in today’s world. Even though I recognize that no department alone can be responsible for developing the kinds of civic, economic, and political literacies that our students need to achieve their goals, I strongly encourage them to seek out opportunities that unite their work in other fields with the study of German. Additionally, I consider it essential that my students have regular contact with native German speakers, either in person as writers-in residence, or through video conferencing or skyping. The interactions may happen between our students and those from other colleges (i.e., Colgate and Vassar in 2005 and 2007) or students who are studying abroad (i.e., with Fulbright research grantee Nicole Dieterich in 2015) or between students from my Business German class interviewing a company executive, or students from my literature class and writers, artists or professors (i.e. with the stage director Nicolas Stemann or Prof. Doppler, U of Paderborn). With a generous grant from the Max Kade Foundation, Lafayette College established the Center for German Studies (http://maxkade.lafayette.edu/). Since its inception in 2003, I have served as its director and established the Center as the hub of Lafayette’s German program and the community site for our “Friends of German.” The Center’s collaboration with other departments has been highly successful in providing a rich intercultural dynamic to teaching and research across disciplines. 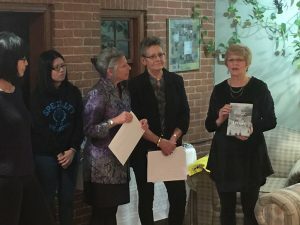 In particular, the Center’s program for writers and artists in residence, as well as distinguished professors from multidisciplinary academic fields, has been instrumental in enhancing the breadth and depth of course offerings for our German majors and students with advanced German proficiency. 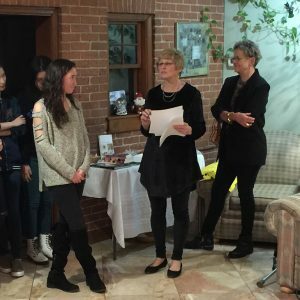 In 2017, the Max Kade Foundation awarded Lafayette College a $600,000 grant to establish the Max Kade House that will provide living quarters for visiting scholars and writers/artists-in-residence. See https://news.lafayette.edu/2016/10/07/expanding-our-commitment-to-german-studies/. For our engineering students in their fourth semester, Lafayette offers a faculty-led program at Jacob University in Bremen that our German program supports by offering additional German language/ culture courses on the elementary (I & II) and intermediate (I) levels. In order to become eligible for internships in Germany, students must perform with high intermediate proficiency (B2) and have a strong overall GPA. To assist our students to better achieve this goal, I designed a sequence of language and culture courses (“pipeline“) that is now part of Lafayette College’s “inclusive STEM“ education. Additionally, I was instrumental in redesigning the Six-week German Language and Culture Immersion program in Bonn, Germany (on-site host: Academy for International Education). It is, to date, the only language immersion faculty-led program that Lafayette College owns. Shortly after I joined Lafayette College in 1992, the Kappa Nu chapter of the National Honor Society, Delta Phi Alpha was established at Lafayette College. As its faculty advisor I have inducted nearly 150 students to celebrate their commitment to the German language and culture and their outstanding academic achievements. 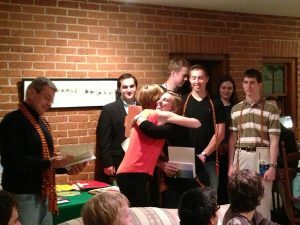 Additionally during these years, I have nominated about 35 honorary members (faculty from different disciplines and administrative staff members) as gratitude for their support to the German program but also to build a vibrant German community across academic disciplines that would welcome students with a love for all things German. The Undergraduate Research Conference (URC) in German Studies is an interdisciplinary conference that was founded in 2011 by Axel Hildebrandt, Heikki Lempa (both from Moravian College) and me and is held annually at Moravian or Lafayette College. The URC in German Studies is made possible by the close collaboration between faculty and students that emerge around shared investigations, which is an important strength of liberal arts colleges. Since the first URC approximately 180 students from thirty different US and Canadian institutions have presented their papers and posters. To hear and see so many outstanding students engage in research on a great variety of German-related cross-disciplinary and inter-disciplinary topics with excellence and sophistication makes this day one of the most inspiring and gratifying in my academic year. A jury of faculty members that attend the conference choose the Max Kade Prize for the best paper presentation and select three honorary mentions. The papers of the awardees are shared with the public on the conference’s website. Our German program is steadily growing contrary to the national trend. 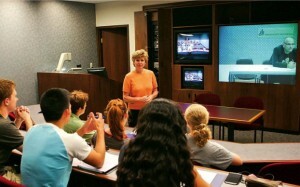 Despite the fact that nearly all of our students are pursuing a second field of study in the social sciences (i.e., International Affairs, Anthropology & Sociology, History, Government & Law, Math, and Economics) or the natural sciences (i.e., Environmental Science, Geology, Neuroscience, Biology, and Engineering), we teach about 150 students per year and recently registered the largest number of majors and minors in over a decade. Shara Gregory, Class of 2004, with an A.B. in German and International Affairs received a Fulbright English TAship and spent two years in Aachen, Germany from 2004 to 2006. She is a German HS teacher in Pennsylvania and several of her students are enrolled in Lafayette’s German program. Briana Niblick, Class of 2005 with a B.S. degree in Environmental Engineering and an A.B. in German. She was a Fulbright Scholar at the Bodenkultur University in Austria and continued her doctoral studies at the University of Pittsburgh. After completing her Ph.D., Dr. Niblick taught as Visiting Assistant Professor at the University of Stuttgart’s Institute for Bau- und Umweltingenieurwissenschaften from 2013 to 2015. She is now teaching at the University of Cincinnati. Benjamin McPherson, Class of 2012 with an A.B. in German and History, is a German high school teacher at Delaware Regional HS in New Jersey. Jacob Dein, Class of 2013 with a B.S. in civil engineering major and a minor in German, a Fulbright Research Grant recipient to study at the Univ. of Innsbruck in Austria from 2015 to 2016. Nicole Dieterich, Class of 2014 with a B.S. in Neuroscience and A.B. in German, was a Fulbright Research grant recipient and worked with a research group affiliated with the Univ. of Salzburg, Austria from 2014 to 2016. Sarah Henderson, Class of 2016 with a B.S. in Physics and an A.B. in German, currently pursues a Ph.D. in Astrophysics at the Rheinische Friedrich-Wilhelms-Universität in Bonn, Germany.